There are no windows too big or too small for The A Clean team. We can handle any type of window cleaning job in the Yorkshire Area and have the expertise and experience to cover all types of windows. This can range from delicate sash and Georgian windows, to the latest uPVC double-glazed windows. Our entire window cleaning staff is highly experienced and are trained to work on both residential and commercial properties. The A Clean team has the most advanced tools and technologies in the cleaning industry. For our window cleaning service we utilise the revolutionary Reach & Wash System, which is designed to be safe, reliable and provide a high quality finish. 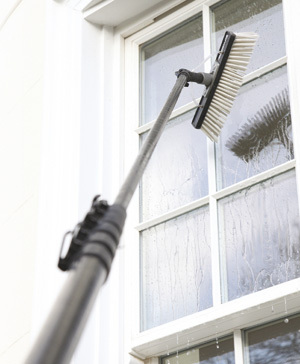 At each visit we clean the frames and sills with the help of our special curved sill brush. We have each aspect of our window cleaning service down to the finest detail, from our tools to the water we use. We understand the importance of the type of water we use, that’s why we only use 100% laboratory grade, de-ionised pure water. This helps remove dirt from the glass and prevent dirt from sticking. Meaning your windows stay cleaner for longer.